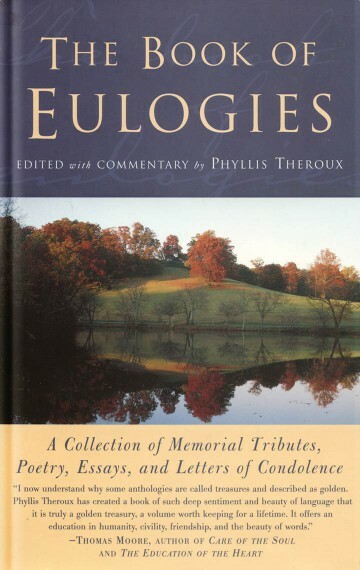 This invaluable anthology is the first and only collection dedicated to the art of the eulogy. For the past several years, Phyllis Theroux has collected the most eloquent and moving writing commemorating a death, assessing a life, or offering solace to the bereaved. Ranging from Thomas Jefferson’s magisterial eulogy for George Washington to Anna Quindlen’s affectionate memorial for her grandmother; from Helen Keller’s words about her dear friend Mark Twain to Adlai Stevenson’s about Eleanor Roosevelt, The Book of Eulogies establishes that great eulogies are a celebration of remarkable lives that can illuminate, confirm, inspire, and redirect our own. Theroux has included some of the world’s most well-known tributes, such as Pericles’ Funeral Oration, Jules Michelet’s appreciation of Jeanne d’Arc, Victor Hugo’s ringing words on the one hundredth anniversary of Voltaire’s death, Cardinal Suenens’s eulogy for Pope John XXIII. But most of the eulogized assembled here are eighteenth- to twentieth-century Americans, and the stories of their lives illuminate our history with a particularly intimate light. In Robert Kennedy’s extemporaneous remarks upon hearing of the death of Martin Luther King, or Eugene McCarthy’s tribute to his friend and colleague, Hubert Humphrey, the values, wisdom, and spirit of both the eulogized and the eulogizer are revealed. Every June her family retreated from Brooklyn to Southampton, where Catholic houses and stables and cottages sat like dowagers above the Atlantic. The sun was served up daily as though the best specimen of fruit in season has been delivered from Herbert’s Market on a Spode plate. Breezes bent the dunegrass, sowed salt and sand onto striped summer slipcovers, into drawers of summer towels and summer silver. Seersucker nannies fussed past shirtsleeved gardeners and grooms. Linen cooks and laundresses tended to clergy in sport shirts. Weekend uncles came by rail, loosening ties. Aunts arranged zinnias by day and read stories at twilight to little cousins in cotton pajamas who turned brown as the rotogravure. She rode horseback in the fields. She played tennis and golf. She practiced French. She dreamed romantic dreams, fixed her hair, and danced the foxtrot with young men called “beaux.” Nightly she said her prayers and sometimes she prayed for someone. I want to remember her before I was there to remember, before she would turn to the handsome man on her left and realize he was the one who would usher her into her next life where there would be no doting father to order cut flowers be planted in the cooling September soil, one by one, down to the seawater swimming pool for the debutante party of which, on principle, he disapproved.